Angie Simms and Stuart Quinn’s first hardcover adventure recipe book, published in November, 2016. Award-winning Stradbroke Island photographers Angie Simms and Stuart Quinn have roamed the world with their cameras in hand. Between them they’ve backpacked overland from the United Kingdom to Australia, camped in a ger in the Gobi Desert in Mongolia and in a leaky tent on the side of a cliff in Wales, gone shooting with Hells Angels and travelled platzkart class through Russia on the Trans Siberian Railway. They’ve even downed homemade corn wine and helped eat the dowry of six pigs at a wedding in the mountains of Vietnam. But for their latest adventure they cast their eye – and attention - much closer to home, venturing out from behind the lens to shine a spotlight on the small slice of paradise that is Queensland’s Stradbroke Island. 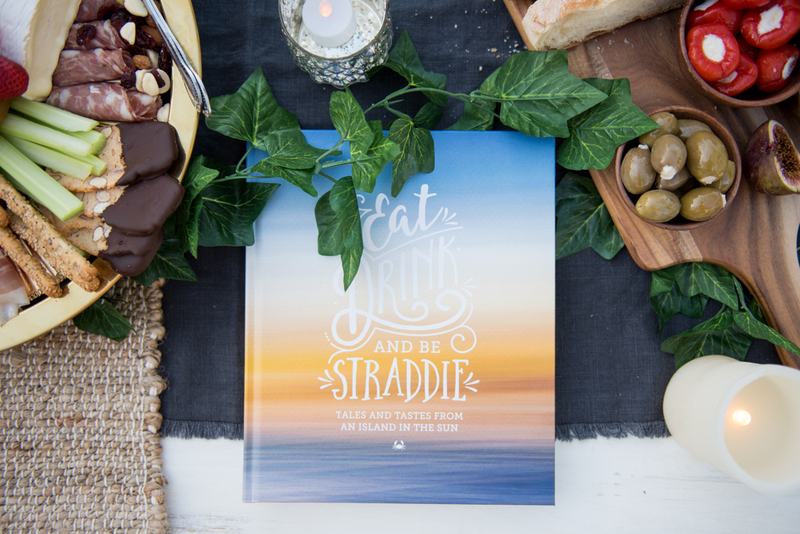 The end result is a full-colour cookbook named Eat, Drink and Be Straddie: Tales and Tastes from an Island in the Sun. The 200-page tome, contains 100 beautifully photographed recipes, all of which feature ingredients sourced on the island, from seafood and bush tucker to organic local honey. These are accompanied by feature stories on the island’s producers, a timeline of key historical events, a forward by Australian sporting icon Matthew Hayden and a welcome by Quandamooka elder Dr Aunty Joan Hendriks. The outcome is an adventure and a recipe book all rolled into one. As Angie explains, the cookbook was put together over the course of a year, but was much, much longer in the inspiration. “Our favourite thing to do is travel,” she explains. “We love adventure and exploration and always make a point of getting away from the touristy parts of a country to discover stories and sights unseen." “This also allows us to indulge in our second favourite pastime, which is eating like a local, and we’ve made some great memories this way." “One of our favourite experiences was being invited to lunch at a hill tribe market in far north Vietnam (near the border with China), sitting around a giant pot as beautiful elderly villagers ladled soup into bowls." “We’ve dangled our feet in the Mediterranean as we drank a carafe of local wine, and been jostled in a standing-room only California marketplace, watching the world go by as our nostrils – and tummies – filled with incredible food." The book also serves as a little bit of a thank you to the island that unexpectedly captured their heart. Angie takes up the story. “I first discovered Straddie more than 10 years ago,” she explains. “I had recently returned from three years travelling overseas and came over to the island to visit my sister. Suffice to say, Straddie had cast its spell, which it later did on Stu as well, prompting the couple to relocate to the island with their dog Chester, get married, and set up a thriving business, Stradbroke Island Photography. The move only enhanced their appreciation for some of the island’s biggest drawcards – its people, its stories, its wonderful sense of community spirit and, in their case, an unexpected gift of inspiration. “We’re always on the lookout for a great photo opportunity, and having heard about the island’s famous mullet run, we headed to the beach early one morning to see what it involved,” recalls Stu. “As we watched the fishermen in action, we were struck again by the island’s relationship with food. There’s such a wonderful respect for what the land and sea provide, and we knew we wanted to showcase that spirit to the wider community.” And so the idea for Eat, Drink and Be Straddie was born. The couple, who could already draw culinary expertise from Stu’s previous work as a baker, drew together a high-end team of cooks, designers and wordsmiths to create the book. They also sought out local leading lights, determined to introduce the wider world to some of Straddie’s longest and most iconic characters. “These are the people that come to mind when you use the term ‘local’,” says Angie, who had the joy of convincing them to part with their signature dishes, and a little of their own stories, which run the gauntlet from shipwrecks to spearfishing. Availability: Stocked across Australia. Also available to purchase online.